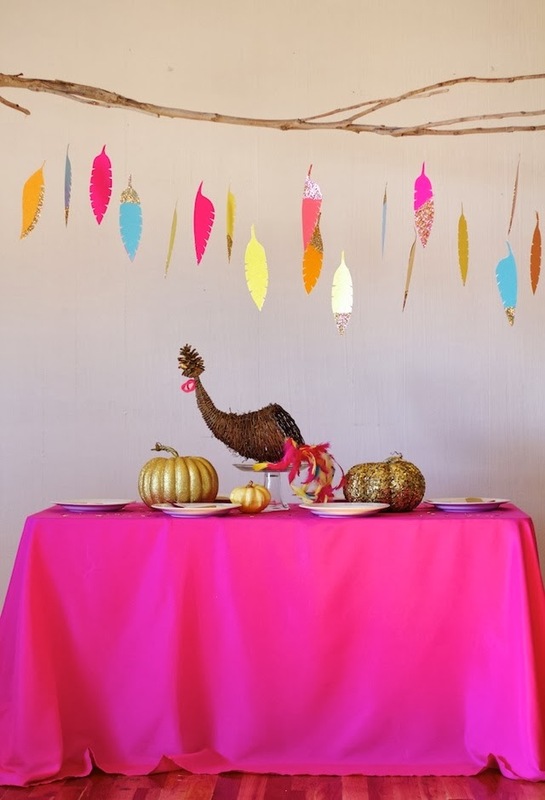 Turkey Tablescape with JoAnn Stores! 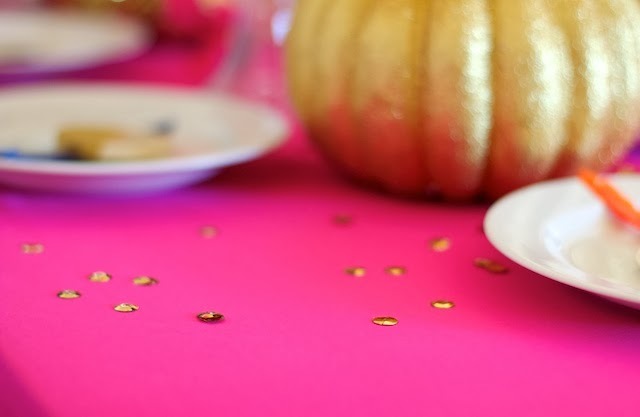 As I've mentioned before, JoAnn's is working with select bloggers to celebrate the holidays with themed challenges using items from JoAnn stores. We did "Spooky Spaces" for halloween and for Thanksgiving we were given the theme "Turkey Tablescapes"! 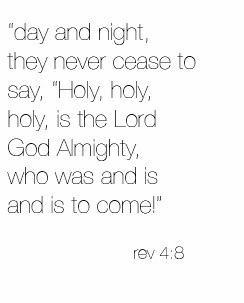 So, can I confess something? I hate turkeys. OK, I don't really hate turkeys. But they're not my favorite animal. The real versions kind of scare me (right?!) 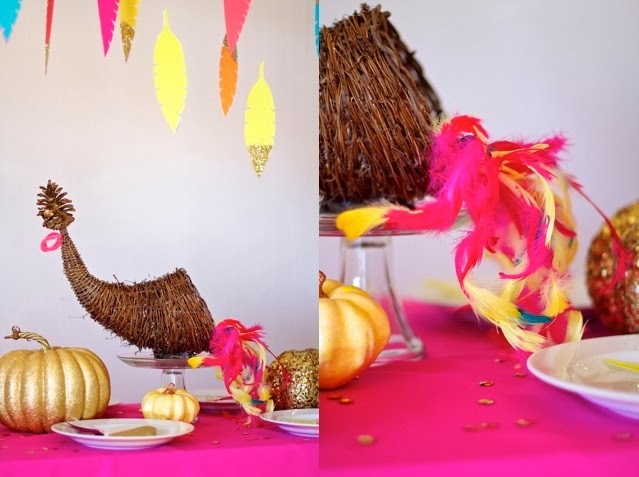 and the little cutesy stuffed turkey decorations are just kind of...kind of...annoying? I don't know why I feel that way! What's wrong with me? Maybe I had a bad dream about turkeys when I was a kid. But anyway I was brave and accepted the turkey challenge!! Aren't you proud? I decided to go a little outside the box and do a kiddy tablescape instead of the elegant grown-up version I had in mind initially. 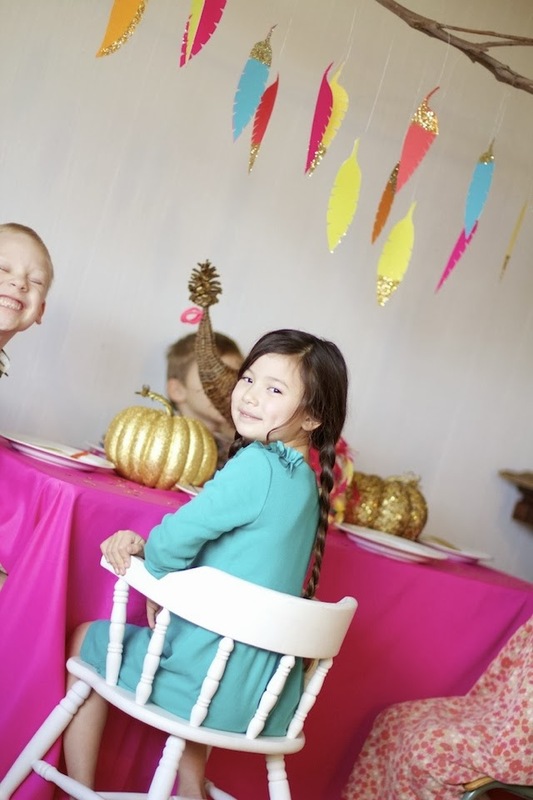 A lot of us probably remember what it was like being banished to the "kid table" at Thanksgiving, so I thought it would be fun to make a whimsical table that kids would be excited to sit at! 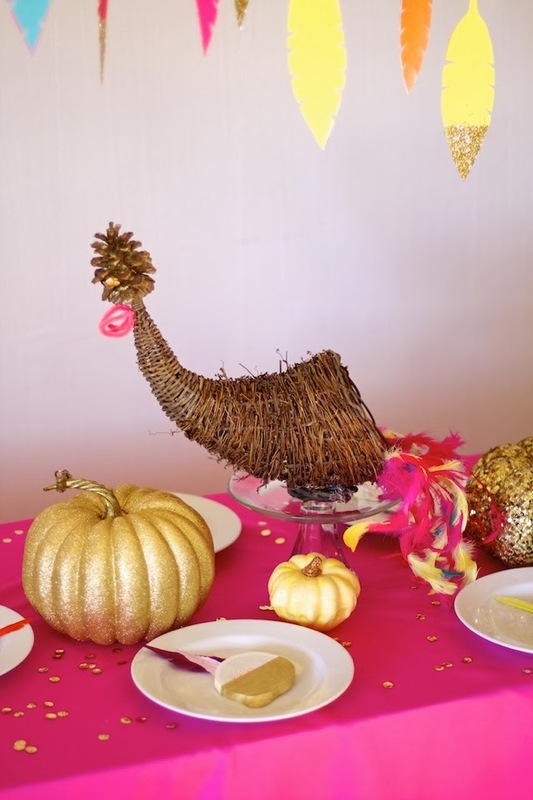 The "turkey" is a grapevine cornucopia that I found at JoAnn's with a pinecone glued onto the tip as a turkey head. I looped a pipe cleaner around my fingers for the wattle. 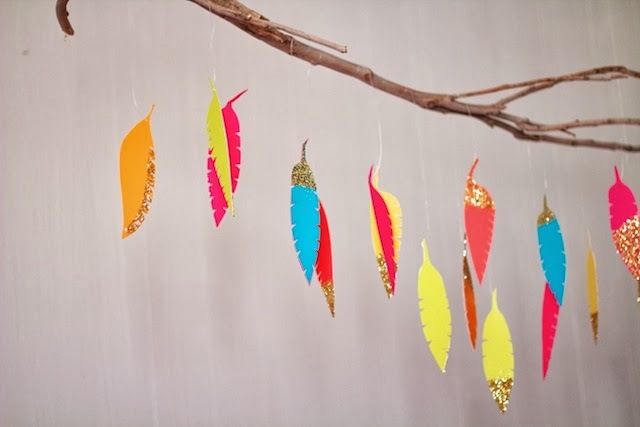 Them I hot glued brightly colored feathers to each other to make long, sweeping tail feathers which I glued to the bottom of the cornucopia opening. I thought it would be fun to have everyone write out what they're thankful for and put the papers into the cornucopia. Then they can read them all after they've eaten! 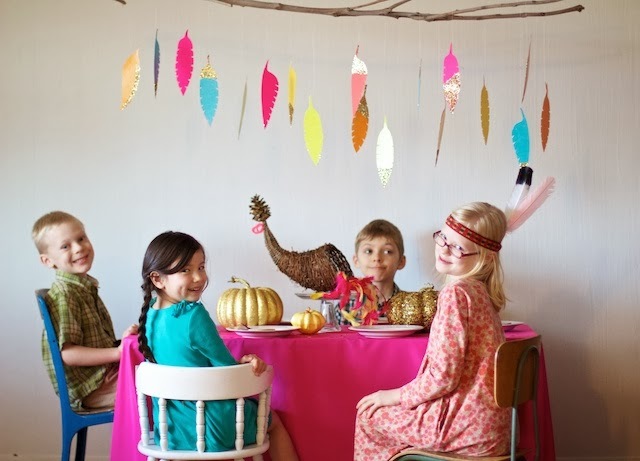 My favorite part of the tablescape is the feathers (or leaves? Everyone thinks they're leaves and that's ok. Leaves are pretty, too!) hanging overhead. I used glitter papers from a cardstock stack that JoAnn's sent me to cut out free hand feather shapes and then Paige helped me glitter the tips or ends. Then we hung them from a tree branch (courtesy of a dead tree in our backyard) with fishing twine. 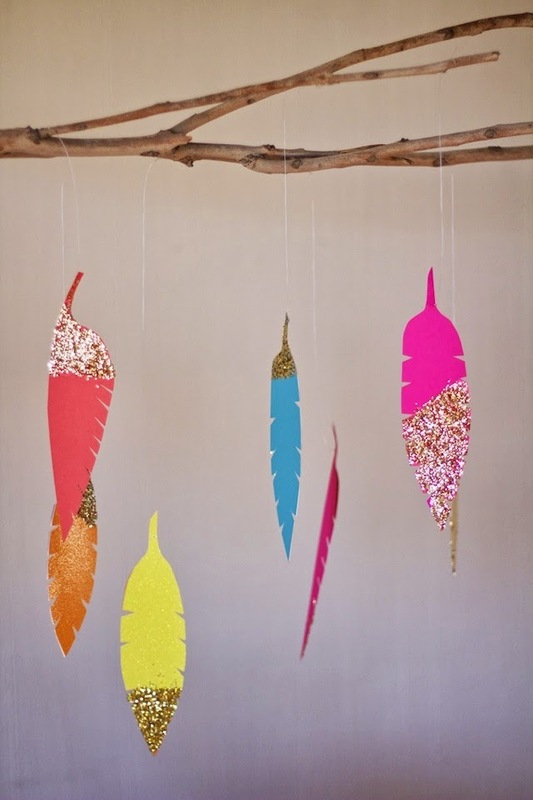 I think I'm going to Mod Podge the feathers to keep the glitter on securely, because I'd love to save these and make them into a garland next year! 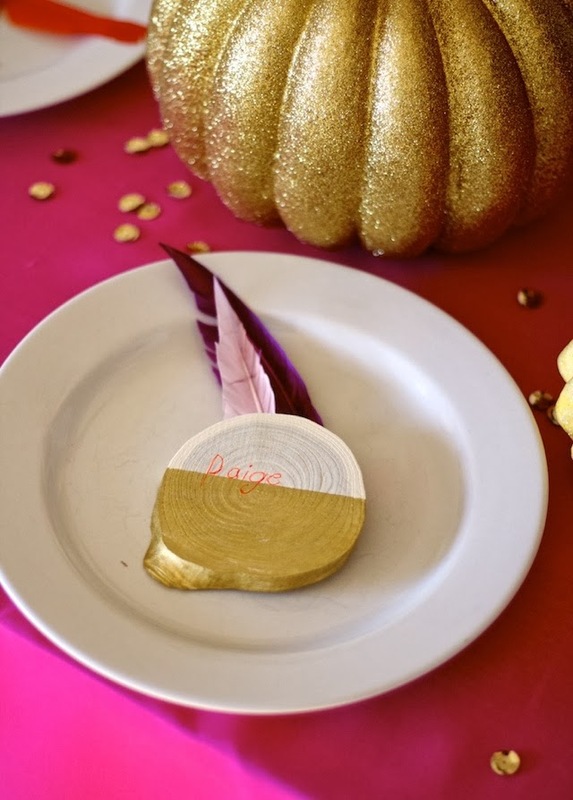 The place "cards" are wooden circles (from JoAnn's!) that I put painter's tape on and then painted with gold acrylic paint and wrote on with neon gel pens. 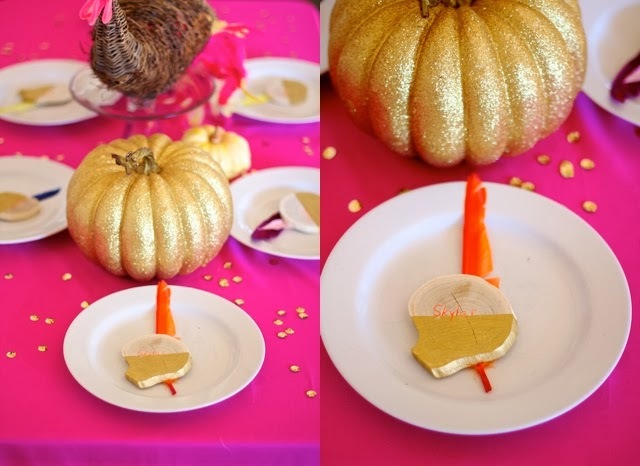 Then I just added a few gold pumpkins and sprinkled large sequins around and called it cute! 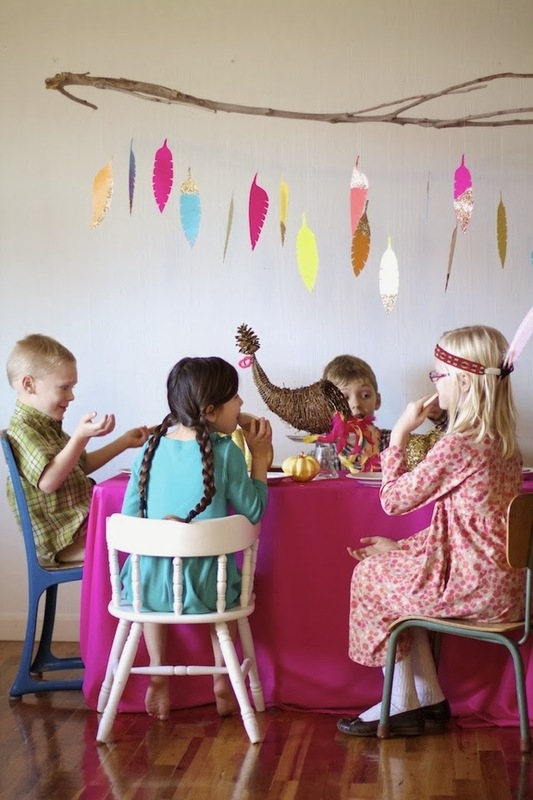 Be sure to search #turkeytablescapes to find more super cute Thanksgiving ideas! 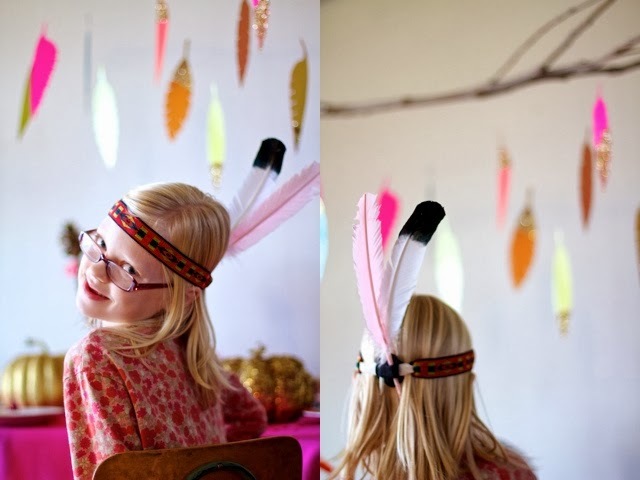 I adore the hanging feathers! They look so whimsical and happy. LOVE what you did, Disney. It also made me laugh because I took the whole "turkey" thing literally too and tried to figure out how to do turkeys in a way I liked. So, I went with feathers and while I stamped feathers onto the runner I made Baden kept saying they were leaves and NOT feathers. Ha! I still haven't posted mine yet, though. Love all your color too. Thanks, Cheri! Ha, yes! At first I was like: "Does that mean...literal 'turkey'?" so I decided to include one just to be safe. Who knew that leaves and feathers were doppelgangers?? I knew they were feathers - and they're so cute!